The announcement that Dairy Crest's last glass milk bottle plant is to close has prompted a flood of nostalgia for a former staple of the British street. Travel back in time to a British doorstep in 1975 at, say, 7.30am. There's almost certainly a couple of foil-topped glass milk bottles there. Maybe more. Some of the tops may have been pecked by birds, although if you left a couple of plastic cups out the milkman probably popped those over the top of the bottles to protect them. Then, 94% of milk was put into glass bottles, according to Dairy Crest. By 2012, this was just 4%. "I can remember that wonderful clinking sound of the milk bottles arriving," says consumer historian Robert Opie. Then there was the ubiquitous morning whirr of electric floats. Others remember the colour coding on the foil tops. And that weirdly satisfying way of opening them - a push just powerful enough to dent but not break it. "Birds were attracted to peck away at the caps to get to the cream line," says Paul Luke, editor of Milk Bottle News and the owner of some 12,000-13,000 glass milk bottles. Cream lines occurred all the time even if it was semi-skimmed, he says, since milk didn't go through the same standardisation process as it does today. "When you poured out the milk you'd get a big bulk of cream drop on to your cornflakes, rather than your watered down milk [of today]," Luke says. As a nine-year-old, Luke started helping out milkmen on their rounds during the 1980s. Leaving out the empties represents many people's first understanding of the concept of recycling. But there's been a slow and sure decline, says Opie. The proliferation of fridges in the 1950s, which allowed milk to be kept longer, meant fewer daily deliveries. By the 1990s, the deregulation of the British milk industry and the decision by supermarkets to sell milk - cheaply - in plastic containers changed everything. Some still mourn - on taste grounds alone. "I can remember that relatively traumatic moment when I switched from glass to a carton," says Opie. "There was just something innately wrong about pouring milk out of a carton because it didn't have that refreshing coolness of a glass bottle. "A cold bottle of milk has a certain integrity to it and the glass retains that." But, of course, Opie - as well as virtually everybody else - went ahead and made the switch. "Nostalgia has a waft which extends into every sphere you can think of," Opie says, "and sometimes it's only when things disappear that you suddenly stand back and think, 'Oh, what a shame'." Convenience and cost has triumphed. Smaller dairies may continue to provide milk in glass bottles. But Dairy Crest switching to plastic is significant. In 1970, almost 99% of milk would have been door-delivered, says Tom Phelps, the author of The British Milkman. Last year Dairy UK found that doorstep delivery stands at less than 5% of the liquid dairy market. 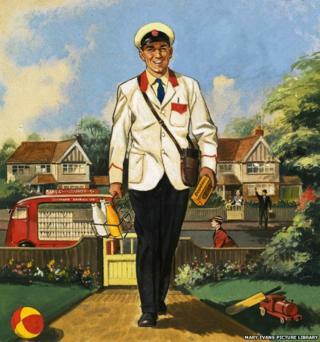 But there are still about 5,000 milkmen left in the UK, Phelps estimates. About 1,400 of those are employed by Dairy Crest, which stresses that the switch to plastic containers is to "ensure the livelihoods" of its milkmen and women. Much of this is due to the costs of plastic against glass. Glass bottles are more expensive to make than plastic containers and also weigh 15 times more, says Dairy Crest. This means plastic containers are cheaper to transport, with the company claiming that they're now as environmentally friendly as glass bottles. The issue is unclear. The Waste and Resources Action Programme (Wrap) published a 2010 paper suggesting that the carbon footprint of glass bottles over the course of a life-cycle is helped by the fact it is recycled. The era of the glass milk bottle has left a legacy. Not least memories of the way milk used to be advertised. "The best ever promotion to sell milk was done by Unigate," says Luke. He's referring to the series of 1970s adverts in which mysterious creatures called Humphreys attempted to steal milk with long straws. "Watch out, watch out, there's a Humphrey about," was the slogan. Muhammad Ali got involved. The catchphrase "Gotta lotta bottle" followed. It's hard to imagine a series of more 1980s-style videos - whirlwinds of dazzling neon, innuendo, and the chanted tagline "nice cold, ice cold milk". This was an era when Linford Christie raced a milk float. But the nostalgia relates as much to the diminished presence of the milkman as the bottles themselves. Their ever-presence in British lives made them ripe for pop culture parody - mainly the faintly ludicrous idea of them having adulterous relationships with lonely women. Benny Hill's 1970 comedy song Ernie (The Fastest Milkman in the West) - one of David Cameron's Desert Island Discs - was about the protagonist's love for a lonely widow named Sue. A Monty Python sketch depicted a semi-dressed woman luring Michael Palin's milkman into her house - only to lock him away into a room of other long-lost milkmen. By 1920s and 1930s glass-bottled milk is the norm, but bottles had cardboard slips at the top, which children used to play "pogs"
1980 - modern version of bottle introduced. Shorter and wider, initially it was nicknamed "dumpy"
It was probably an unfair reputation for most milkmen, but the jokes rested on the centrality of milkmen in daily life. Milkmen regularly had a career of 30 to 40 years and often became family friends, says Phelps. "The milkman would go around and collect the money and would then be invited in for a cup of tea," adds Luke. Familiarity meant that customers were happy to leave money in the bottles. Or sometimes just notes like "not this week, thanks". Not that these were always intelligible, recalls Phelps from his brief personal experience as a milkman before he worked for Unigate. But often there were birthday messages, and sometimes even gifts for milkmen's newborn kids, he says. Such message-in-a-bottle correspondence seems like a quaint relic today. And now face-to-face interaction is even sparser. Milkmen sometimes start their shift as early as 23:00 the night before, Luke says. Fewer customers mean that they have to cover larger areas, he adds. Payments are often by debit card. "Certainly now, when you go into a school and ask a child where milk comes from, the response is always Tesco's," says Luke. "You show them milk bottles and they don't know what they are."